Bike trailers for babies offer genuine thrills and memories that infants and toddlers do not seem to forget. Often, your baby will show signs of exhilaration on the announcement that she is about to have a bike ride to the supermarket with mom or dad. Add a promise of a ride to the park where the can have fun and there will be a burst of excitement. 1. Number and Age of Your Kids. 2. Riding Terrain and Frequency. 6. Shade and Rain Covers. The Yellow Bee Bike Trailer by Burley Design is a medium-priced baby bike trailer is a lightweight baby bike trailer that can accommodate two babies around one year old. The colorful yellow and black trailer (thus dubbed ‘Bee’) is quite conspicuous to other bikers, minimizing the chances of a collision. It also features an innovative Flex-Connector, allowing you to lay your bike on the ground while the trailer remains at an upright position. The tinted rear and side windows have a UPF 30 sunray protection grade for ultimate comfort for your baby. The trailer also has adequate storage space. It is recommended for toddlers and older babies (i.e. 1 year and above), supporting up to 100 pounds. It is lightweight (only 21 pounds) and yet it can support up to 100 pound of baby weight; also allows to easy storage and transport. It features a full internal aluminium roll cage with a 5-point safety harness which greatly increases you child’s safety. It also has a rear tailgate which makes it easy for you to access cargo, adding to the sufficient loading space. The baby trailer has 20-inch alternating spoke wheels which ensures a comfortable and safe ride at an adequate ride height. The trailer folds easily for transport and storage, thus saving you loads of space. It does not have any suspension, making off-road adventures quite tricky, despite its sturdy build. The Aosom Double Baby Bike Trailer: Elite II is a moderately-priced baby bike trailer with a tripod-wheel setup ideal for up to two toddlers. It comes with a full suspension system, making both urban and off-road adventures comfortable and fun for your kids. The trailer also features a hand-brake locking system for the real wheels, ideal for locking the trailer into place when parked. 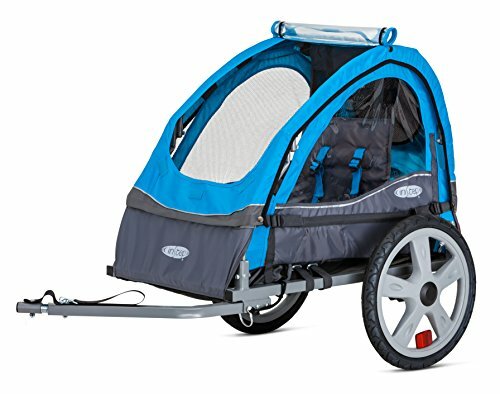 The front wheel can swivel, making the trailer usable as a stroller as well, or can be disconnected completely while bike trailing or jogging. The baby trailer is best for babies from 10 months old. 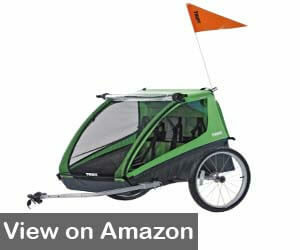 It features multiple uses including strolling, jogging, and bike trailing. It is fairly-priced given its many features such as a full suspension system and off-road capability. Control is easy with the locking rear wheels and the swivel front wheel which is removable. The lightweight steel frame as well as the all-terrain 20-inch wheels ensures a sturdy yet safe and comfortable ride for your baby. It cam comfortably hold two toddlers from the age of 10 months. It does not require any tools for setting it up or breaking it down for storage or transport. It also has an all-weather canvas and nylon canopy with a mesh. It only supports up to 88 pounds of baby weight. It does not feature adequate storage space. The Schwinn Single-Bike Trailblazer offers unique versatility for bike trailers especially in urban settings, with a smooth and neat transition from storage to use. It also features a universal coupler that can work easily with any bike. The baby bike trailer offers room for one baby up to 40 pounds in weight, an adequate load space, and a double canopy for all outdoorsy weather conditions. Ideal for children from 12 months and above. It has a unique steel folding frame with a quick release, thus easy for you to move around with. 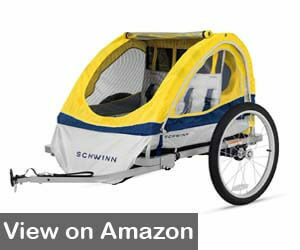 The Schwinn Single-Bike Trailblazer features a two-in-one canopy with weather shielding and a bug screen. The 16-inch wheels with spokes offer adequate ride comfort on pavements. It also features lots of load space especially since it carries one baby at a go. The trailer is confined to urban pavement; no off-road capabilities especially due to a lack of suspension and lower ground clearance compared to its peers. 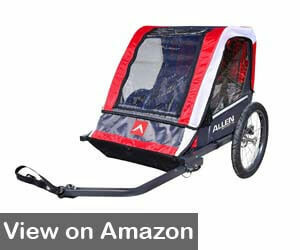 The Twin Steel-Frame Bicycle Trailer by Allen Sports is an easy ride for your baby. It features a durable but lightweight steel frame which is an easy fix for most bikes. When you are not using it, you can store it easily with the straightforward folding and quick-release design. The lightweight steel frame construction still ensures enough sturdiness with a maximum baby payload of 100 pounds. This is complemented by the 16-inch rugged inflated wheels. The trailer is ideal toddlers from 10 months or above. The baby trailer features a lightweight steel construction with intuitive rugged steel-spoke wheels for enhanced sturdiness and comfort. It can comfortably support two babies each weighing 50 pounds despite the lightweight construction. It has a foot-guard tube that adds protection for your babies’ feet. 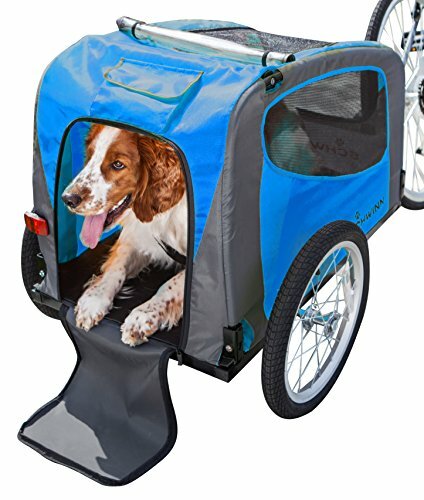 The quick release and easy folding design ensures easy transportation. The package also includes a brightly-coloured safety flag. The storage space is so small especially considering you need to carry items for two babies. 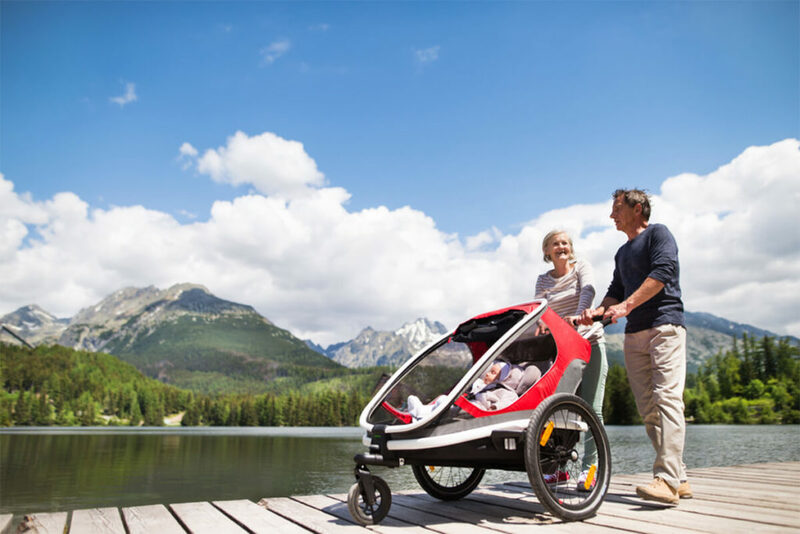 The Double Baby Bike Trailer by In-Step is a comfy two-seater baby trailer that features support and padding for your two little passengers as well as a 2-in-1 weather screen/bug mesh canopy that ensures coziness of every outdoor excursion in any weather. 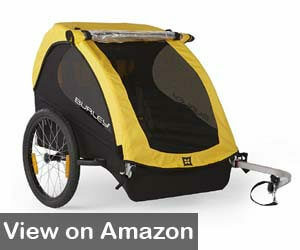 The trailer also features a collapsible frame with quick releases that provides you with compact storage as you travel. 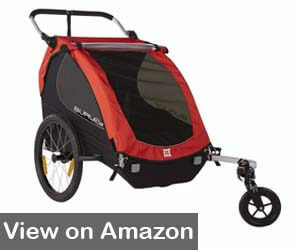 It also features a detachable swivel wheel, allowing you to smoothly shift from strolling, jogging, to biking. Ideal for children at least 1 year old. The trailer offers exemplary value for your money especially if you are recreational. It features simply designed folds for ease of transport or storage, in addition to the two-in-one weather/bug mesh feature for utmost baby comfort. The trailer wheels are 16-inch pneumatic air-filled tires with sturdy rims for enhanced performance and style in the outdoors. The coupler is an easy fit for most bikes. It is not sturdy enough for off-road excursions. 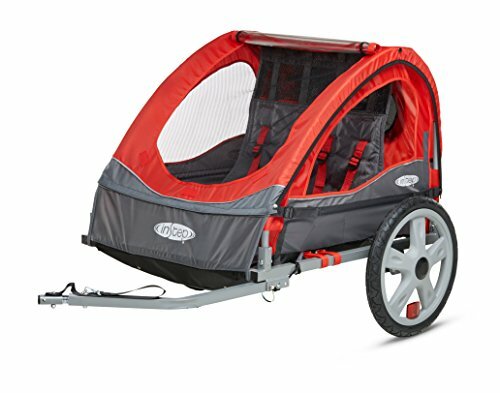 This is a baby bike trailer that carries one baby at a go and features 16-inch pneumatic tires with forged rims for adequate comfort on paved bike trails. It is best used in urban settings such as paved outdoor areas and parks as it does not feature any suspension. The trailer is ideal for toddlers from the age of 11 months. The versatile couple, made of steel and rubber, fits on most bike mounts. Offers a two-in-one canopy design with a bug mesh and all-weather protection for your baby. Your baby is assured of comfort and protection, thanks to the robust pneumatic tires and 2-in-1 canopy design. It can only bear a maximum payload of 40 pounds, thus greatly limiting its use. The storage area is still inadequate despite being a single carrier. Manufactured by one of the most competent baby trailer manufacturers, the Cadence Two-Child Bike Trailer by Thule is an interestingly-designed baby trailer for two, comfortably supporting up to 100 pounds of payload. Its “not shy” 21-inch spoke steel and rubber wheels are able to support your babies’ weight comfortably without any strain and are even recommended for mild off-road adventures. The package consists of a free mountable trailer flag. It is ideal for babies from year of age. The canopy is wide enough for two babies to sit in snuggly and comfortably. It features a Thule bike-trailer arm kit. 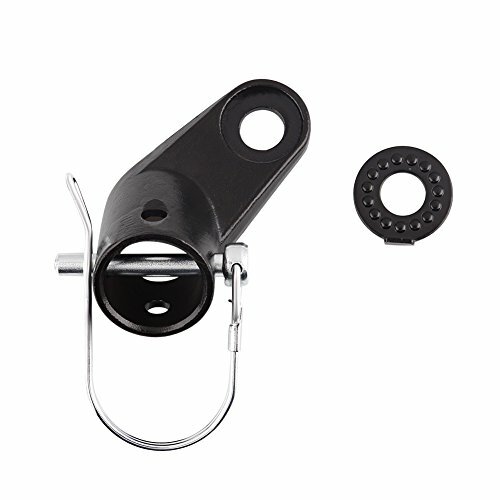 The patented Thule ez-Hitch coupler offers tremendous and unique coupling capabilities with your bike. There is enough storage space for your babies’ items. The canopy roof is folds uniquely, offering adequate outdoor views for your children. It also features an all-weather rain cover and the trailer can be easily folded for transport and storage. The lack of suspension limits the trailer’s outdoor capability, despite it many intuitive features. 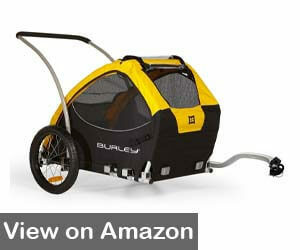 Burley’s Tail-Wagon is a mid-priced baby bike trailer for one kid. It offers an intuitive design with lots of capabilities, despite being a single carrier. The Burley Design Trailer also comes with sturdy quick-release 16-inch alloy wheels which offer utmost comfort, making the trailer suitable for mild off-roading adventures. The is recommended for babies who are 1 year or older, with a maximum weightage of 75 pounds. The design is unique, with a removable floor panel for easier washing. The trailer features enhanced side battens for better ride stability, alongside a flip-down tailgate for loading capabilities. It comes with an all-weather fold-down cover with water-proofed zippers and a heavy-duty mesh covering all four sides, increasing airflow and viewability for your baby. 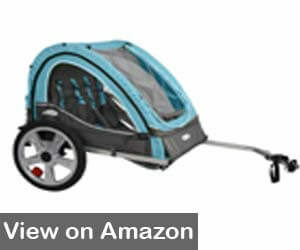 The trailer is also stroller-compatible or convertible with easy deployment of extra wheels. This also allows for easy storage and transport. The product offers a limited warranty (comprehensive) for all fabric-based parts for up to 1 year, and a three-year comprehensive warranty for the steel and plastic parts. Despite having durable alloy wheels which are ideal for off-road adventures, this trailer offers no suspension. 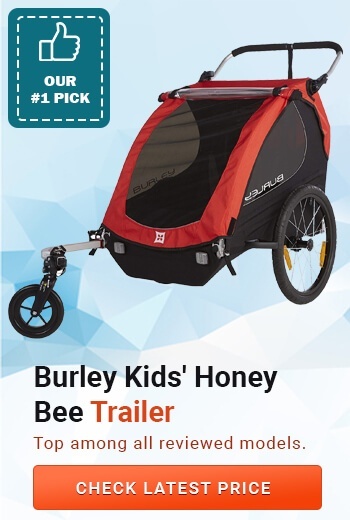 The Honey Bee Kids’ Trailer by Burley Design is an ergonomically designed baby bike trailer that offers a perfect balance between versatility and value with no compromise on safety. This two-seater offers a hammock-styled seating arrangement for your babies, thus giving you the chance to off-road without holding bask since they are not sitting on the trailer floor. The trailer also comes with a standard five-point harness safety belt system, helmet pockets, as well as extra padding for added comfort on any terrain. There is also an adjustable foam-lined handle bar offering wide adjustability in different modes. The trailer is ideal for babies from 8 months and above. There is a standard all-aluminium role cage as well as hub-engaged parking brakes below the rear reflectors, easily deployed even using your foot. This adds additional safety for your babies. The hammock-designed seats act as some sort of suspension, so you may even opt for off-road biking challenges. The side windows are well tinted with a UPF 30 rating for enhanced protection from harmful UV-rays. The ergonomic and adjustable handle bar allows for different heights as well as forward biking mode with the inclusion of the removable swivel wheel. The only thing that possibly lacks from this intuitively-designed product is the wheel suspension for off-road biking. The Schwinn Double Eco-Bike Trailer is an ergonomically-designed moderately priced baby bike trailer equipped with 20-inch alloy rims and air-filled tires, providing maximum style and performance both on paved and off-road paths. The trailer also features large windows and meshed surfaces for better viewability and air circulation for your babies. The seats come with helmet meshes as well as shoulder padding, further enhancing comfort on off-road excursions. It is most suitable for babies as young as 3 months, going forward. The tires are sufficiently big and well rugged to handle all manner of terrains. The trailer has wide viewability for the babies while providing adequate protection from bugs as well as free air, thanks to the wide windows and mesh. There is an all-weather two-in-one canopy, making sure you and your babies are not limited by the weather. There are additional safety features for the baby such as the shoulder pad and helmets. Lack of suspension may cause a bumpy ride for your babies especially on off-road adventures, given that the seats are not suspended themselves or hammock-designed. While the trailer experience might be one of the best for your baby, choosing the appropriate bike trailer for your baby might be an overwhelming task, adding the fact that there are multiple options to choose from in the market. Often, you will consider factors such as which is the best bike trailer option for your young ones? How long can it serve your babies? Should you go for a budget option or the best model the market has to offer? Using this best bike trailer for kids guide, you are assured of electing just the right trailer to help you and your babies explore nature with utmost ease. 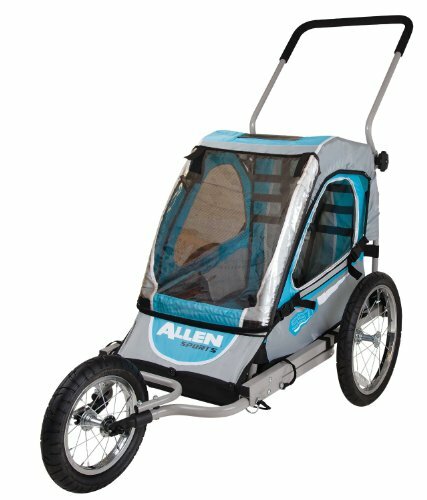 If you are simply looking for a standard bike trailer for baby, any stroller that mounts on to your bike’s rea axle can work. However, to find just the right trailer that works best for you and your baby, you would like to consider several factors such as how many kids you have, their age, the frequency of biking, weather elements, and your tentative budget. Here are some of the main factors to consider. In any case, make sure that your babies are secured to the trailer using the harness and should also have a well-fitting helmet during your outdoor excursions. From here, you can choose between single or double trailer. If you have one kid but you are planning on having another, you can opt for the double trailer which you can still use with one child. Also, when choosing the baby bike trailer, check for its maneuverability in tight spaces as well as it weight capacity, considering the age of your baby or babies. A good trailer will manage towing a weight of 100 pounds comfortably. When choosing which baby bike trailer to buy, the outdoor terrain you mostly plan on having your baby adventures should be a key determinant. Consider the use of your baby trailer, i.e. do you plan on riding up the trickier mountain roads or are you planning to replace your car commutes with the baby trailer? Or are you simply looking forward to having occasional cruises on the paved estate and local park roads? 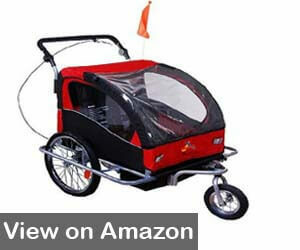 If you are looking at the former, you should invest in a more comfortable, more sophisticated baby bike trailer (i.e. more features) with the right set of terrain wheels. For the latter, you are free to go for a more standard option with lesser features but offering the right safety and comfort features. 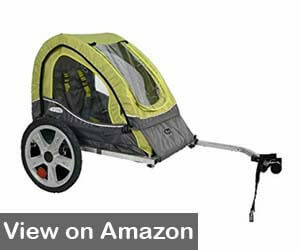 Also, you may opt for a convertible multi-sport baby trailer for different types of terrain. Although these kinds of trailer are a tad more expensive, they are great for multiple activities such as fat-biking and skiing rather than purchasing separate gear for each activity. Suspension is largely dependent on the type of biking you plan on doing. If most of your biking will be on smooth surfaces such as paved bike paths, you may opt out on investing on trailer suspension. However, if off-road biking on forest service paths and gravel trails, you must then invest in the appropriate baby trailer suspension. However, even on the smooth city bike paths, suspension can make your child’s outdoor experience more fun, comfortable, and memorable. For your baby, you will need to carry along stuff such as diaper changes, snacks, toys, and so on. You may also require some extra space to pick up a bag of groceries or some books. For frequent commuting with your babies, choose a trailer with adequate storage space. 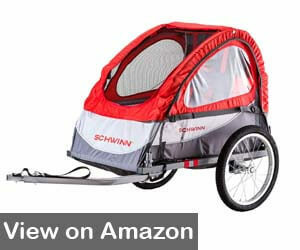 Most baby bike trailers range between $100 and $1000, which is quite an enormous budget range. Unfortunately, the higher end trailers offer a wider range of perks such as durable fabrics, adequate ventilation, on-road and off-road suspension, and lots of storage space. If this is affordable for you, you can always go for it. However, most of the appropriate baby bike features will be available in the mid-price range. If you are planning on having your outdoor excursions with baby on different weather conditions, always opt for a trailer with sufficient shade and rain covers to protect your child against the elements. Better still, with such a trailer, you will always be prepared in case the weather catches you off-guard. The choice of baby bike trailer you make will greatly determine the fun and memorability of your outdoor excursions with baby. It is always recommended to consider the factors discussed herein before purchasing a baby bike trailer. With a consideration of features such as the outdoor terrain, trailer suspension, storage space, number and age of your kids, trailer weight capacity, and its ability to fend off different weather elements, you are assured of selecting the best baby bike trailer for you and your children to enjoy and have fun.